YouthLinks, a global virtual platform, uses mobile technology to develop young people’s employability skills. 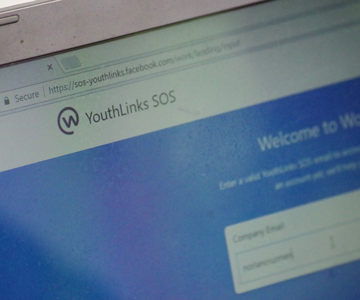 Based on Facebook Workplace, YouthLinks digitally connects young people aged 16 - 25 in SOS Children’s Villages’ programmes with mentors coming from the corporate world, various institutions, and other partners in order to maximise and scale the impact of mentorship programmes. The digital connection offers flexibility in terms of time, breaks down geographical barriers and allows one mentor to support a number of young people. YouthLinks also works as a content repository where young people can find materials and tools that help them prepare to join the job market. The risk of social and labour market exclusion is especially high for young people at risk of losing parental care or who have already lost it. They cannot count on the support networks of their families and are less likely to have access to positive role models, skills training and work experience. They face a higher risk of being unemployed, experiencing precarious employment conditions, and poverty. Job mentorship programmes are a great opportunity for young people to receive guidance and increase their employment prospects, but they sometimes face challenges: mentors have limited time; the geographical distance makes connecting difficult; the number of young people interested in mentorships exceeds the number of mentors. Experience has shown that the employees of corporate partners who mentor young people are more motivated and more loyal to the company after participating in such programmes. Through YouthLinks they are able to not only support young people in their own countries, but also connect with young people abroad who do not have access to skills trainings locally. In addition, the employees are able to develop their digital and mentorship skills and learn more about their own professional sectors. YouthLinks gives corporate partners the opportunity to reinforce their corporate social responsibility strategy and strengthen their presence beyond their home country. By supporting YouthLinks, they actively contribute to achieving the Sustainable Development Goals and make a tangible impact on young people’s lives. In 2018, it will be rolled out in 15 more countries around the globe.